We have FINALLY gotten warm weather!!! The kids were so excited. Yesterday we did a water slide, and today we put the sprinklers on under the tramp. It was so fun!! 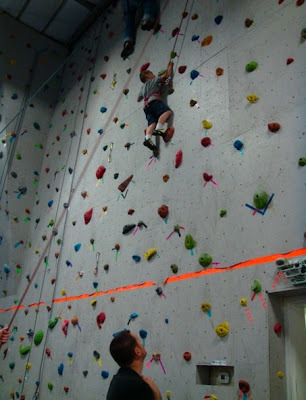 tyson and I took the kids to a gymnastics place in town, and they have a indoor climbing wall. Nash wanted to try it so bad. He did AWESOME! 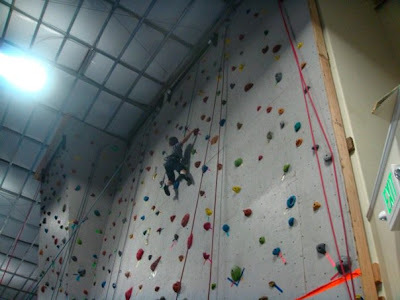 He started off on the "easier" side and once he got to the top he was determined to try all the harder climbs. He ended up getting to the top 7 times! He's such a determined little bugger. 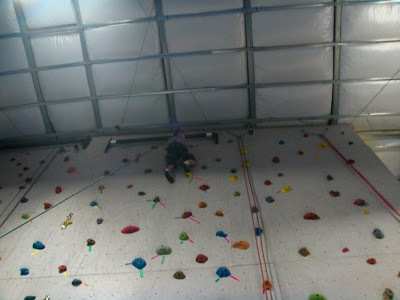 He loved that when you get to the top, you ring a bell that's there, so everyone in the gym could hear him. There was one part that has a ledge, and you have to climb over the ledge and get on top of it, he tried it....got on top but was really nervous to come down from it. But with a little help....he did it. And said next time he goes he doesn't want ANY help. Thats my Nash-terd.